More on lazy jacks – here and here. Full of excitement and anticipation, we left the mooring on the Tamar and motored a short way downstream to be free of the boats around us. 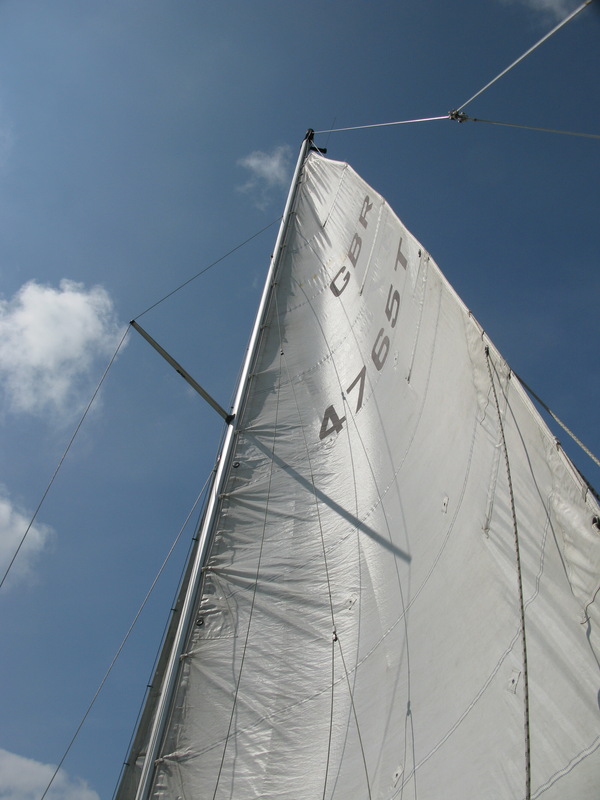 We turned into the wind and I hauled on the halyard and up went the sail . . . and promptly jammed about half way up. Yes – you guessed it, lazy jacks again. The upper sail batten had caught beneath the upper block. So I let the sail down a little, and tried again. It got caught again. Tried again, this time more cunningly – watch . . . wait for the moment . . . up she goes! What happened next? The engine was killed, the bow fell away, the sail caught the wind and we discovered that blissful, heart-lifting moment when wind and water and boat blend together. Did we think about lazy jacks then. Of course not. As a result, over the next few months, we went through the same circus every time we raised the mainsail – watch . . . wait for the moment . . . up she goes. Until I began to think about how unhandy it was, particularly if I was sailing solo. 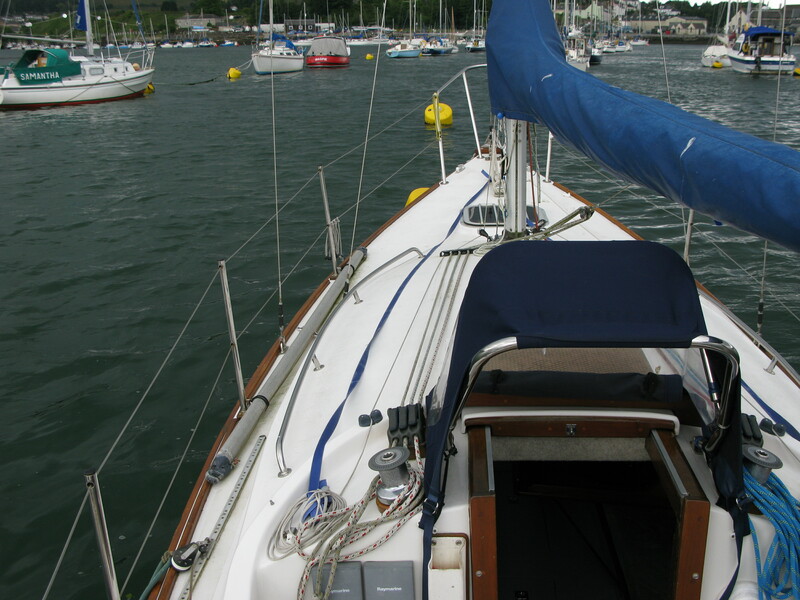 When alone, I would release the halyard clutch, bring the boat into the wind, ease off the throttle, go to the fore end of the cockpit and hurriedly haul on the halyard to get the sail aloft before the bow fell away on the wind – inevitably the top batten got caught and, as the bow fell away, we would start to sail with the mainsail half set. Then it was back and forward, juggling between using the engine to bring the boat back into the wind and going forward to lower the sail, release the batten, and raise it before the batten danced yet again behind the lazy jack and we had to start the whole process all over again. 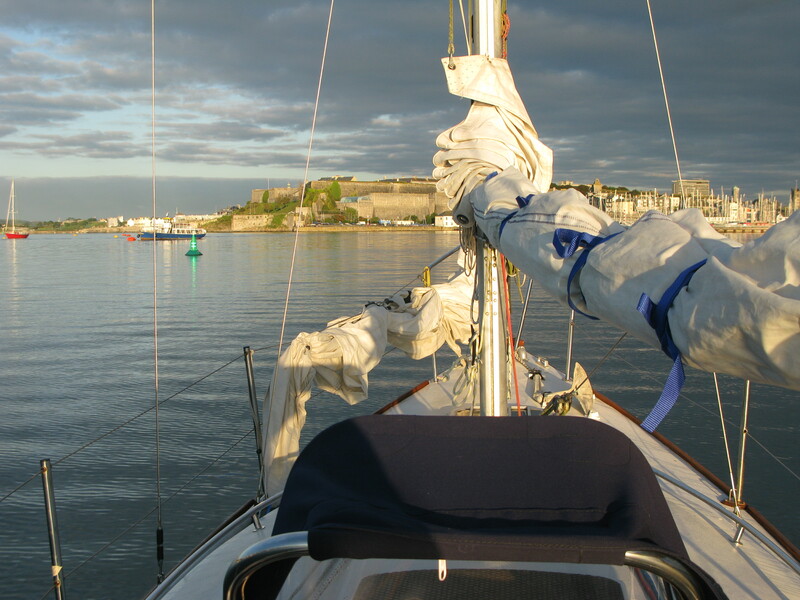 I have just read in the February 2012 issue of Sailing Today a letter from a reader, Tony Waldeck, advocating lazy jacks as a good way of containing the bunt of a reefed mainsail. Yes, that’s a good idea, although I have yet to use it. He states. “Lazy jacks are the answer – but not the off-the-shelf kits that incorporate blocks. 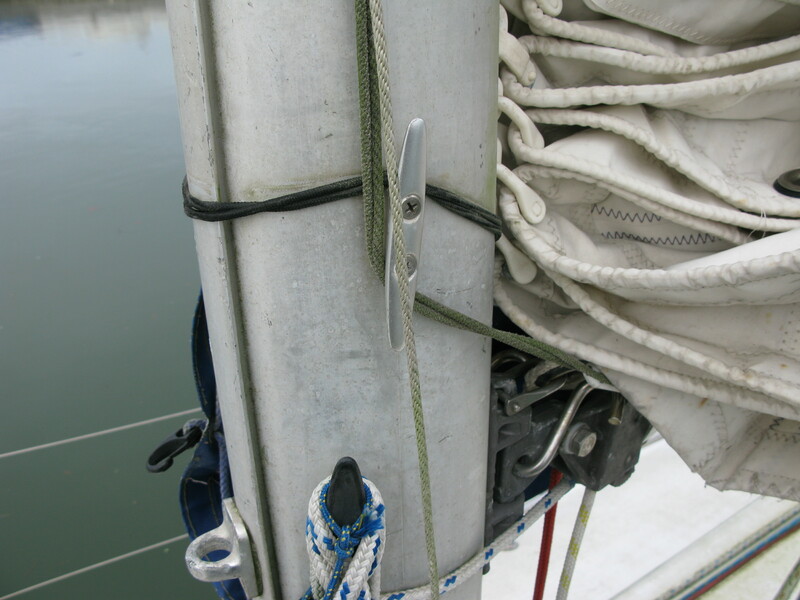 All-string arrangements will not chafe the mainsail.” (An off-the-shelf kit is rigged on Blue Mistress. You can see the blocks on the sail below). There, George, you have it – almost everything I know about lazy jacks. Judging by the amount of time and energy they have cost me, ‘lazy’ is a pretty poor description. p.s. This is where I look back and wonder why it took so long to reach such a simple solution. Maybe this is the most useful lesson. The world’s full of experts and no doubt every one of them could have told me the answer. Solutions are simple, especially in the evening around the bar – it’s getting to them that’s the problem. It has to be the experience of solving problems that makes all solutions worth pursuing. Over the years, I have read many, many ‘boat books’ and I use a lot of what I have found in them, but the most enjoyable aspects of sailing, and certainly the parts I’m best at, are those I have had to work out for myself. The first sentence in A C Stock’s introduction to his book ‘Sailing Just For Fun’ reads: “This book is for the man who has read all the ‘How-to’ books and still finds that he cannot.” Well, the more I know, the more I find I cannot. I used to worry about this, but no longer – I’m having too good a time finding out.